SAN FRANCISCO (CNNMoney.com) -- Twitter's 145 million users will soon be able to embed photos and video clips into their 140-character-long tweets, the company announced on Tuesday as it unveiled one of its first major revamps. The fast-growing microblogging service said the new features are part of a major overhaul focused on making Twitter more user-friendly. "It's faster, it's easier and it's a richer experience," Evan Williams, Twitter co-founder and CEO, said at the company's San Francisco headquarters. "Simple things that are cryptic on Twitter today become a lot more clear." The updated Twitter.com features an expanded sidebar that shows related content when you click on a specific Tweet, eliminating the need to toggle back and forth between different Web pages. 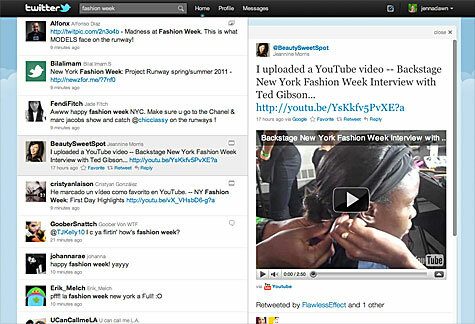 The company partnered with 16 media providers, included Yahoo's Flickr and Google's YouTube, to let users embed pictures and playable videos directly on Twitter.com. That cuts a step out of the previous navigation path, which required clicking on a link to view images or clips. The new Twitter.com also includes the ability to scroll down the page without having to press a "more" button. While an increasing number of people are accessing Twitter on their iPhones and other mobile devices, only 16% of tweeters start out using the service on their cell phones, company executives said at Tuesday's event. That heightened their focus on making the native Twitter.com experience a smooth one. A select group of users -- including members of the media who attended the launch event in San Francisco -- were given access to the new Twitter.com immediately. A larger rollout will take place more gradually; Twitter executives wouldn't say when it will be completed. The move is part of Twitter's ongoing shift from promising startup to entrenched Web giant. While the four-year-old company has insisted on what it calls a "slow and thoughtful approach to monetization," it's been criticized for not turning a profit -- or even proving that it has a viable business model. Earlier this year, Twitter launched "Promoted Tweets," a money-making plan featuring 140-character ads purchased by companies like Starbucks and Red Bull. Tuesday's announcement gives the company -- which is backed by $160 million in venture capital -- a bigger multimedia field to play on. "Obviously, there's more opportunities for more info to be displayed now," Biz Stone, Twitter's co-founder, said in an interview with CNNMoney. "It's a great opportunity for all sorts of content, including ads."